Yesterday I added something to the frog pond. It made me sad and yet liberated at the same time. The item I reduced to it's component parts was the Austin Hoodie I started in August 2011. I had such high hopes for this lovely garment. I had a lovely pattern and delicious yarn and it felt like it was all going so well. So what went wrong? I became a better knitter. I left the project alone for nearly a year and I did a bit more, and then I picked it up again this week and I tried it on, because all I was missing was one sleeve and a hood Then I really looked at it, and I just wasn't happy with it. The trouble i,s I started knitting this just after I started using Continental Style knitting and it caused quite uneven rows, which were glaringly obvious in the loose gauge this garment is knit in. 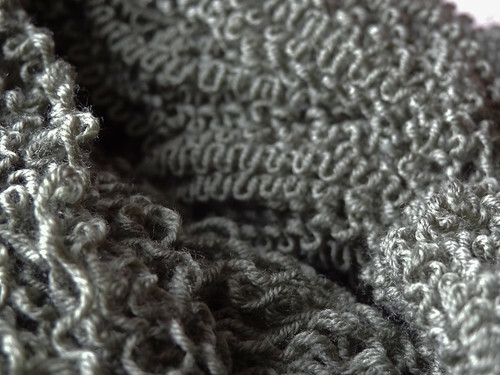 I tried to ignore it, but once I started using Combination knitting and my rows became all neat and even again, the big loops spread through the garment drove me insane. I think because Debbie Bliss Rialto 4 ply is such a smooth yarn it didn't fluff up to fill the gaps, the way a less rounded yarn would. I had hoped that blocking it would help, which it did, but not enough. The hem was also a bit annoying. It would not sit flat, despite the blocking. I KNEW that would drive me cuckoo too. Then the final straw is that I decided I didn't want another hoodie. I find that they don't sit well under my Winter coat. I never use any of the hoods I make because I always wear hats, which seems a waste of good yarn to me. I decided that I wanted to use this very pretty wool for something else. So for the first time I decided to frog something properly. I got my Sunflower Swift out and started unravelling to make skeins. I'm really pleased I did, because this yarn is very very kinked indeed. 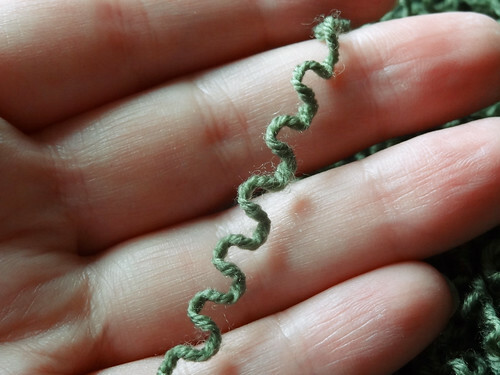 This yarn is definitely in need of resetting. It's just a mass of curls. 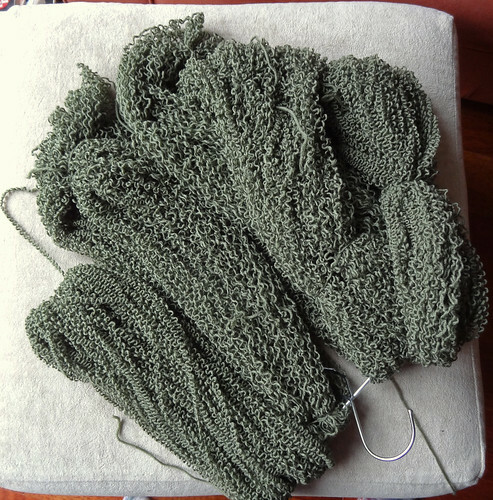 It took several hours to unwind the garment and I have several very curly skeins left as a result of my endeavours. I tied them off to secure them, and now I will take my mass of yarn and soak and reset the skeins by drying under tension. I think in the case of this fine yarn, just weighting it with a coat hanger will be enough. So now I have to find a garment to use this lovely yarn for. I have about 1800m of it, which should be enough for a decent sized cardigan or sweater. I've done an initial scan on Ravelry and not found much that works for me. I may use it to knit a Laika without a hood, but part of me is just tempted to do a simple top town sweater made to my own measurements with maybe a simple lace pattern as an accent somewhere. At least that way I would get something that worked for me. It's a tough choice because this is quite special yarn and I don't want to waste it. Any recommendations would be gratefully received!